Anybody unable to see the chat on a mobile or tablet needs to switch to desktop view or via their browser settings. Click on the chat button in the bottom right of the screen. Wait a few moments for the speech bubble to appear, then click on it. Click on the room you wish to enter, then on the pop up box click on the section that says, "Log in or Sign up now". If you haven't used this chat before then you may need to click on New User? Register Now. Then on the Welcome screen either log in with facebook or an email address. You will then see the list of chat rooms, just click on one and enter. Once logged in you can edit your screen name so that it shows your correct site username by clicking on the 3 horizontal lines, you can also add a custom picture or avatar there. If you use Tapatalk to access the forums and don't switch to Desktop mode then you need to click on the navigation drop down button and then click on Mobile Chat. If you are using a pc or laptop and are having issues with disappearing rooms or them not behaving when you try to move them around......this is my experience on how to get rooms back. You'll need to zoom WAY out. You can do this with either browser settings, or sometimes there is a spot on browser to right of a addy window, or you can hold down the ctrl key while moving mouse wheel up/down to zoom in or out. Once zoomed all the way out you can see and reposition rooms then zoom back in. 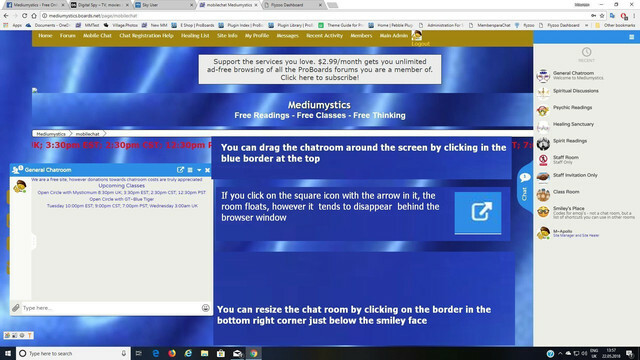 I am unable to get into Chat Room - the Chat Room Button is not showing in the bottom Right of the screen. Could I have some help please? Thank you Apollo I am on my computer not a tablet or mobile. Thank you Apollo I will try that.